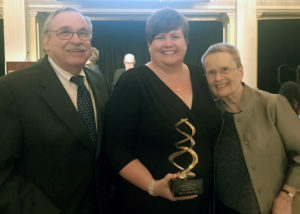 Julie Gaines, medical librarian and core faculty member at the Augusta University/University of Georgia Medical Partnership, recently was honored by the Friends of the National Library of Medicine with the 2018 Michael E. DeBakey Library Services Outreach Award for her achievements as an outstanding outreach health sciences librarian. Established in the early 1990s, the DeBakey Award honors a practicing health sciences librarian who provides outstanding services to rural or underserved communities. Gaines was nominated by Brenda Seago, director of libraries at Augusta University. In her role at the AU/UGA Medical Partnership, Gaines has contributed extensive work toward lectures about evidence-based medicine, mentoring students and faculty through the process of obtaining information, helping all learners to discriminate the quality of information, and teaching students and faculty to use the literature to answer clinical and basic science questions both at the bedside and in the classroom. Gaines also plays a significant role in the community and population health components of the curriculum where there is an emphasis on self-directed and small group learning. Outside the classroom, Gaines has contributed to research and collaborations on technology needs, including social, medical and mobile technologies in academic and clinical settings; was the first librarian accepted as a Service-Learning Fellow at the University of Georgia; was the chair of the Augusta Universities Library Faculty Assembly; and is the chair of the Medical Library Association’s Grant and Scholarship Committee.